'A Walk by the River Ribble. Yesterday I walked by the river with my husband and little dog Skip. On our left, the river at low tide provided a feeding ground for a great variety of birds. On our right, a field of ripe golden barley, soon to be harvested. It is hard to believe that such a lovely rural area can be so close to a city. The river, the fields, the banks of the river with a rich variety of wild flowers, give the whole area a feeling of peace and rural tranquillity. On our walk we met many people like ourselves enjoying the calming influence of a little bit of rural England. This is the area on which Preston City Council are planning to build a large number of houses, plus shops, hotels, and a promenade: for what purpose? Certainly not for the benefit of this beautiful place or its residents. We walked on to the tram bridge where my husband enjoyed one of his favourite views looking up the river towards Brockholes and Darwin Moor in the distance. When by the river I am filled with girlhood memories of long summer days spent by the river at Brockholes. We even found a pool clean and clear enough to swim in. At very low tide we could walk across the river and watch a farmer shearing his sheep, and in another nearby field cattle grazed. The fields, the banks of the river, the woods carpeted with bluebells in Spring (which in those days we would take home in armfuls I’m afraid) were always there for us to enjoy. We thought for always. 'There is one specific feature which I have not seen reported recently (but could well have been). In quite a few summers of the 1960's, when the river was more polluted, there were vivid instances of de-oxygenation. I witnessed them between the Grand Union railway bridge and Broadgate in particular. They were associated with floating rafts of mud buoyed up by gases produced by decay. The gases floated the mud off the bottom onto the surface. There were bubbles breaking the surface all over. Coarse fish would simply gasp until dead and float away on the surface. No doubt others died under water without being seen. Eels would wriggle out of the water and up the bank. Flounders would similarly come to the side to die with their head parts out of the water. 'Hi. I just looked at your website, completely by chance. Nice pictures. Crumbs, what a to-do. Well, I wish you luck. I used to go out with a girl from Clitheroe and I remember it as a lovely part of the country. 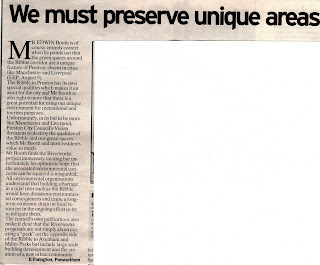 You can click on the image to read the letter in full, but this local Ribblesider points out that 'the green spaces around the Ribble corridor are a unique feature of Preston, absent in cities like Manchester and Liverpool' and that 'there is a great potential for using our unique environment for recreational and tourism purposes'. E. Farington points out that 'unfortunately, in its bid to become more like Manchester and Liverpool, Preston City Council's Vision threatens to destroy the qualities of the Ribble and our green spaces which... most residents value so much', and further, 'All environmental organisations understand that building a barrage on a tidal river such as the Ribble would have disastrous environmental consequences and cause a long term economic drain on local resources'. Local Ribblesiders recognise that our unique River and green spaces are 'assets' - which is why the Council must not be allowed to build all over them! Such heart-felt concerns as these are repeated by Ribbleside residents week in and week out, and clearly show the enormous value that local people place on the Ribble and our green spaces - which is why we will fight to defend them! Long Live The Ribble Wild!! Preston Riversway Councillor, Jack Davenport, has raised further concerns about the recent proposals to restructure Preston Vision Board, claiming the reorganisation 'will do little to encourage the idea that there will be more democratic involvement'. 'The proposals outlined seem to make a move towards greater private sector control, with the council being reduced to a mere consultative role. They will weaken the already poor "partnership" and undermine the public's faith in democratic representation'. Further, Councillor Davenport is concerned that 'developments in Preston' should be 'guided by public, not private sector need', arguing that 'Only the council, as a democratically representative body, has the authority to make that judgment', and pointing out that this authority is granted 'not by private business or interest, but by the people of this city'. "Having council leaders on board is a good thing" but "It's my responsibility as chairman to make sure it doesn't slow the process" !!! Local residents are equally concerned about the Vision currently being pursued by Preston City Council itself, as there appears to be equal enthusiasm for the Ribble barrage and the Penwortham green belt/floodplain development proposals amongst the ruling majority on Preston City Council as there is on the Vision Board. As part of this, local residents and a number of Councillors are deeply concerned about Preston Council's recent vote to remove decisions regarding large funding bids - such as for Riverworks - from the full scrutiny and democratic accountability of full council chamber and into a select City Centre Committee. As such, questions of democratic accountability extend far beyond the Vision Board and into the Council itself. So far we have seen no serious consultation of local people undertaken by this council regarding the Riverworks Barrage and floodplain development proposals. - We were assured that we would be consulted about the brief for the consultancy of the feasibility study funding bid the council are planning to submit to the North West Development Agency this financial year - BUT WE WERE NOT ASSURED THAT LOCAL PEOPLE WOULD BE CONSULTED ABOUT WHETHER THE BID WOULD GO AHEAD IN THE FIRST PLACE - DESPITE THE OVERWHELMING EVIDENCE THAT LOCAL PEOPLE DON'T WANT THE BARRAGE! - No opportunity was given at the meeting to discuss the real concerns of local people and numerous environmental organisations about the environmental impacts of the barrage and floodplain development schemes, but we were assured that "THE COUNCIL WOULD NOT WISH TO PROCEED BEYOND THE STUDY IF THE ENVIRONMENTAL IMPACT WAS AS IRRETRIEVABLY ADVERSE AS SOME ARE PREDICTING"!!! If the council are prepared to accept environmental impact up to the point of irretrievable damage, then they are clearly more than happy to accept a huge amount of damage, pushing the Ribble's entire ecosystem almost to the point of irretrievable collapse! One of the leaving party is Nicola Turner, who fronts the Preston City Vision and represents both Preston City Council and the Vision Board on the Riverworks project, so we wonder whether her vacant post will be filled...? Mind you, she was also unable to answer the many important questions local people asked her, so the glossy and wholly one-sided presentation was rather limited in terms of real information. The body responsible for Angling interests on the Ribble - and consequently concerned with the health of the River Ribble and its ecosystem - have published their position paper regarding the Ribble barrage proposal. 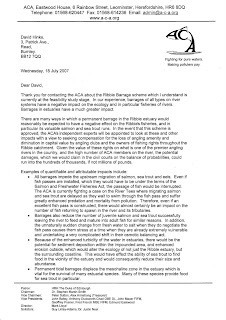 The Ribble Fisheries Consultative Association are unreservedly opposed to the Ribble barrage scheme as they argue that "The building of a barrage across the Ribble most certainly constitutes the greatest threat yet to migratory fish and would irrevocably change the ecology of the whole river system." Their position is strongly supported by the Anglers Conservation Association (ACA), whose own position opposing the Ribble barrage is also published below the RFCA position statement. WHY WE ARE OPPOSED TO A BARRAGE ACROSS THE RIBBLE. When one looks at the history of barrages in England and Wales they have all been detrimental to migratory fish. If we take the last two built as an example. In the Cardiff Bay barrage the Council is facing an annual bill of £20m to attempt to put right environmental damage caused by the barrage. In the case of the Tees the barrage delays the passage of migratory fish thus creating a focus of predation and this matter is subject to a case brought by the ACA. Against this context the Ribble is one of the premier game fishing rivers in England and Wales. Each year in the E.A. Catch statistics the Ribble comes in the top six rivers for salmon, and unusually, also for sea trout. The Ribble is of major importance in the Environment Agencies fight to meet targets for salmon survival. The Ribble was one of five pilots set up to pioneer Salmon Action Plans and is currently piloting a carcass tagging scheme for the E.A., which is expected to become a national scheme within a few years. A barrage would inevitably create a situation where the above would be put at risk as would the national targets. Much of the inter-tidal habitat in the Ribble estuary has Natura 2000 and Ramsar status. The importance of the Ribble catchment is emphasized by the fact that it is the pilot basin for the implementation of the EU Water Framework Directive in the UK. We strongly believe that a barrage across the Ribble would be against these initiatives and put at risk the survival of the Ribble salmon. The sea trout is rapidly becoming a species under threat nationally and measures are currently being discussed to promote the improvement in the sea trout fishery. Significantly, the Irish Sea and the estuary are recognised spawning and nursery areas for the sole and bass together with a recognised shellfish and prawn fishery. We strongly believe that a barrage across the Ribble would be prejudicial to the safeguarding and development of these species. · Siltation - The problem of debris and silt brought down the river is widely acknowledged as one of the contributory factors in the demise of the old docks. There was a constant need for dredging to maintain a channel. The Ribble continues to have a major siltation problem which is recognised by the E.A. in its flood defence reports, particularly as a result of increase “runoff” and increased drainage in the upper catchment. A barrage would merely add to this problem by allowing sedimentation to build up against it. · Water quality - one of the intentions of the proposed barrage is to create a large area of still water. Any reduction in the amount of dissolved oxygen coupled with a greater length of almost still water would be detrimental to migrating fish especially during hot weather when there were low flows in any case. A considerable length of low flowing water would be susceptible to “bloom” – further reducing the amount of dissolved oxygen. In addition, it will provide a breeding ground for flies, midges and algae – thus creating a health and safety issue. Should the siltation turn to mud the river would be present a potential hazard for anyone venturing into the river. Although the quality of the Ribble water has improved in recent years it must be recognised that the Ribble drains both rural and urban areas – each with their own particular pollution problems – including nitrate run off, agricultural pollution, industrial effluents and sewage discharges. The large area of almost still water created by the barrage would act as a depository for such pollutants thus creating a potential health and safety problem. If the barrage was above any polluted influx of water (e.g. Savick Brook) there would be less water to dissipate this pollution causing a reduction in the water quality beyond the barrage. · Flow - The flow behind the barrage would be seriously reduced as indicated above. In addition, the flow from the barrage into the estuary will be significantly changed and therefore pose difficulties for fish coming back to the river as they rely on the outflow to find their way and determine the best time to “run”. · Flood Defence –The potential for flooding is posed by the drainage of the catchment and any lifting of the water level will create potential flooding problems at times of heavy rainfall as much of the flood plain will have been flooded already. There are currently storm and sewage outfalls that are causing problems as they fall below the now increased flood height of the river caused by the increased drainage of the upland areas. · Erosion – the increase flood height throughout the catchment caused by improved drainage of the upland areas means that the river rises much quicker, causes significant additional erosion to the banks to be deposited behind the barrage. A barrage would inevitably effect estuary currents and thus increase the likelihood of erosion of the adjacent coastline. This would have an impact on the internationally designated wetlands and marshlands of the Ribble estuary.
. Smolts - Much of what we have been saying refers to the adult salmon. A barrage would present enormous problems for migrating smolts at a time when they would be at their most vulnerable - just as they adapt to life in salt water by the displacement of the mesohaline zone. The annual value of the Ribble fishery in terms of rod caught salmon is estimated at between £8.5 million and £11 million. On top of this one could put the seatrout catch, which most years is considerable. There is also a small estuary netting arrangement which is guaranteed by the 1975 Salmon and Freshwater Act. 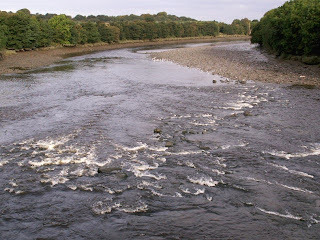 In Salmon Conservation terms the Ribble is a major part of proceedings in England and Wales. Clubs, riparian owners and individual anglers are supporting a variety of measures to improve survival of more salmon. The voluntary put back rate by anglers of caught salmon is running at 75%, the largest % of any river in the North West and one of the highest rates nationally. Whatever happens in the estuary will have a direct effect on the whole catchment - having the potential to irrevocably alter the whole ecology of the river and viability of many a business within the catchment. As can be seen from the above the future of the Ribble Salmon Fishery is delicately balanced. Many people are making strenuous efforts to ensure the Ribble Salmon survives and prospers and there is a legal imperative placed on the E.A to ensure it does. Nothing that puts all this work into jeopardy can be countenanced or accepted. The building of a barrage across the Ribble most certainly constitutes the greatest threat yet to migratory fish and would irrevocably change the ecology of the whole river system. It also appears to be contrary to both European and UK Government policy which states that: “We will work with our partners to remove barriers to migration” (Better sea trout and salmon fisheries 2008-2021). To even consider such a scheme demonstrates a complete lack of understanding of the dynamic nature of estuaries and the interdependence of marine, estuarial and riverine ecosystems. We would much rather see the Ribble estuary celebrated for its rich wildlife and natural qualities, rather than destroyed to create a boating lake and backdrop to development. We would expect Preston City Council and any consultants to address the issues raised above. and it ‘would reduce oxygen levels… thus augmenting the effect of any pollution on fish populations’. 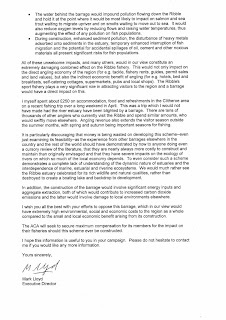 The ACA point out that ‘All these unwelcome impacts, and many others, would… constitute an extremely damaging combined effect on the Ribble fishery’ which ‘would not only impact on the direct angling economy of the region … but also the indirect economic benefit of angling’ such as hotels and other holiday accommodation, pubs and shops etc, and point out the ‘tens of thousands of… anglers who currently visit the Ribble… who would swiftly move elsewhere’ if a barrage was built here. The Lancashire Fisheries Consultative Association are also fully opposed to the Ribble barrage proposals, and you can find out more about Fisheries Consultative Associations at the National Association of Fisheries and Angling Consultatives here. Vision Board to be Made More Accountable - But Who To? 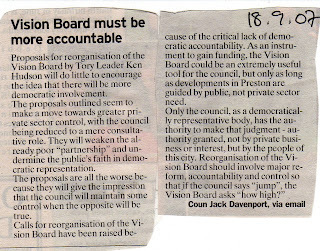 -How will this really ensure that the Preston Vision Board will be fully accountable to the local residents whose communities and quality of life are at risk because of the Vision Board's AND Preston Council's barrage and building development plans? -How will this ensure that what local people WANT to see happen in their communities will finally be listened to? -How will this really ensure either democratic accountability or transparency, especially in view of the fact that the Leader of Preston Council, Ken Hudson, has led the new political alliance at PCC which has voted to remove decisions about big funding bids (such as for Riverworks, say) from the democratic scrutiny and decision-making process of the full Council of our elected representatives into a small select City Centre Committee? -How will these appointments ensure that the views of the people will hold sway over Preston Vision Board's commercially-driven and narrow-minded Vision for the area, given that the Leader of Preston Council, Ken Hudson, has made the Council's intentions to pursue the Riverworks barrage and the associated building developments on the Penwortham Green Belt and floodplain abundantly clear? b. both developments would damage the environment on a national, international, as well as local scale by threatening the natural intertidal functions of THE SINGLE MOST IMPORTANT ESTUARY RIVER IN BRITAIN on the one hand (and the internationally important numbers of bird and fish species which depend on it) and destroying a significant area of Green Belt on the other – Green Belt which is also the floodplain which actively protects our communities from flooding and so far, Preston Council’s ruling political partnership is not taking the floodrisk issues of Riverworks seriously . d. Both schemes would waste outrageous sums of money which would be better spent on some of our estates in Preston which are officially acknowledged by Government figures to be amongst the most deprived wards in the country. -How will these appointments lead to the blinkered Vision for barrages and floodplain developments that both Preston City Council and the Vision Board share being abandoned once and for all in favour of investment in the communities and people who really need it - instead of destroying our finest natural assets for the benefit of property developers and other vested interests? -And HOW will these appointments make the Vision Board MORE ACCOUNTABLE to the people of Preston when the Chairman of the Vision Board and Vice Chancellor of the University, Malcolm McVicar, says that "Having council leaders on board is a good thing" but also says that "It's my responsibility as chairman to make sure it doesn't slow the process" !!! ...and the Preston Bird Watching & Natural History Society commence their 115th consecutive Winter Season of lectures on Monday 24th September. Non-members are welcome. For details visit the Preston Society website. We learn today that Preston City Council's planning committee has rejected two separate schemes to build housing and flats in Preston City Centre. One was a plan by Eastern Estates to knock down a warehouse in Church Row off Church Street, in order to build 54 flats and 6 shops, the other was an application by Oberston Holdings SA to build 54 apartments on a car park on the corner of Rose Street and Shepherd Street, behind Lava and Ignite Nightclub. It seems to contradict European, National, Regional and even local policies and strategies, and basic common sense, that Preston City Council should oppose a hundred new dwellings on these city centre brownfield sites yet support the Riverworks project which includes plans for thousands of houses on beautiful Greenbelt/Floodplain land beside the River Ribble. We wonder what is the explanation for this perversion of our council's housing priorities, that seems to put the interests of powerful developers ahead of the needs of nature and local people? What is clear is that if the council ever says "We have to build housing on greenbelt and floodplain land by the Ribble, because we just can't find brownfield sites to build on", everyone will know that this is simply not true.